Lindsay and Chris run a creative agency, Round Two Creative Group. They make websites, set up email systems, create original content, build sales funnels, and more. But what was their silver bullet? What differentiated them from everyone else? As they drove back to San Diego, it suddenly became clear: they’d talk about hair ties … for guys! Except they didn’t have any hair ties. For guys, or for anyone. Or a website. Or a brand. Or anything — except an idea and a funny commercial they made. That’s when they realized it’s not about a loop of elastic. It’s about why guys with long hair need hair ties for guys. Chris and Lindsay’s story is this month’s Hero’s Journey feature. We’re tapping the collective wisdom of our community members to bring you reports from the front lines of the content marketing world. Read all the Hero’s Journey posts here. Let’s hear directly from Chris and Lindsay to discover how two guys created a recognizable brand around their long hair. Chris Healy and Lindsay Barto: We realized guys with long hair need advocates, education, and a place to celebrate. Advocate: Countless world influencers have been men with long hair, yet today they’re called “slacker” and “hippie,” told to get a job, and that they look like a girl. Long hair is widely considered unprofessional, and there are HR policies and grooming codes prohibiting men from wearing it. Educate: Women tend to learn about caring for their long hair from mothers, aunties, sisters, and friends. Men rarely have that luxury, finding themselves with a head full of locks and unanswered questions, left to figure it out alone. Celebrate: Every man with long hair has a story. His hair is part of his identity, and he’s proud of it. Instead of celebrating that fact, he tends to stay quiet and have friends and family who tolerate it at best. He certainly isn’t high-fiving and chest-bumping along the way to his long-hair goals. He’s relegated to celebrating in silence. Chris Healy and Lindsay Barto: If you’re a guy with long hair and you decide to upgrade from $1 shampoo, where do you go? What do you do if you want to keep your hair out of your face? If you want a nice brush, comb, or something to help with those awful tangles and frizzy hair days? You go to the women’s hair-care aisle. And you stand there, awkwardly, reading product descriptions on pastel-colored packaging about volume and shine that just aren’t speaking your language. There is no aisle for men with long hair. No special place for the unique — but very real — problems they face every single day. Chris Healy and Lindsay Barto: That’s why we conceived The Longhairs. We’re here to solve these problems and fill a void. We advocate for men with long hair. We publish hair knowledge, advice, and tips for guys with locks. And we celebrate men’s long manes with membership referral cards, high fives, and Hair Whip Wednesdays. We offer understanding when no one else understands. And we offer you a hair tie for when you’re eating spaghetti and you don’t have one. Chris Healy and Lindsay Barto: Eight months after the idea and the commercial we created, we launched The Longhairs brand and website at our first annual “Long Manes & Candy Canes” holiday bash. And we started creating content once a week. We never miss. Our content is the cornerstone of our community. We’ve attracted a modest following, but the feedback has been no less than excellent. From longhairs, marketers, smart people, and most everyone. There have been countless indications we’re on the right track. Everyone has ideas: the challenge is making an idea real. In our case, we have a simple product — a little piece of elastic. And yet, it has required time, energy, and commitment to bring to life. It’s a sobering lesson. Because 18 months after finishing our smash-hit commercial, it still hasn’t seen the light of the Internet. It’s now our responsibility to carry this out. Because there are millions of men with hair in their faces. We’ve even learned a significant percentage of men with long hair grow it long for the sole purpose of donating it, which inspires us even more to donate a portion of our sales to this good cause and encourage men who do go under the shears to donate their hair. In short, the challenge is making it real — and we are playing the long game. Chris Healy and Lindsay Barto: The first strategy we implemented is our referral cards. We did a few blog posts about the experience of handing them out and created a program where you can order a free pack from our website. So far we’ve gotten 124 orders from 24 U.S. states and 10 countries outside the U.S., meaning there are 1,240 Longhairs cards out there in the world, in addition to the thousands we’ve handed out ourselves. The cards create an organic, hand-to-hand introduction while garnering a positive reaction more than 90 percent of the time, from guys of all different ages, races, occupations, and appearances. They’ve revealed an unexpected truth: long hair transcends. The second strategy is our lead magnet: Quick Tips, a collection of basic hair knowledge every man with long hair needs, from brushing, washing, growing, caring, and more. It’s free in exchange for an email address. Since launching Quick Tips, we’ve captured 272 email addresses and our audience has responded well. More importantly, those who sign up get access to Quick Tips through our backend membership area, introducing a “logged in” experience, which we’ll be in a great position to use in the future. 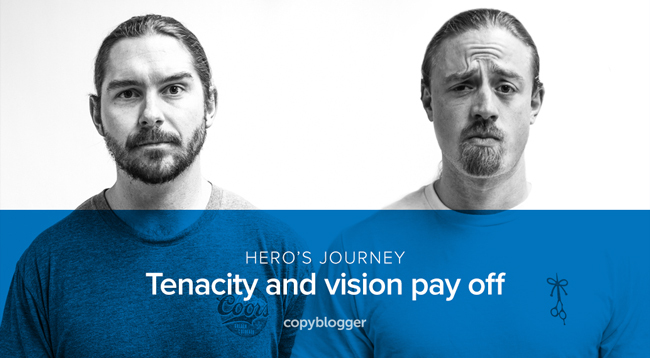 Chris Healy and Lindsay Barto: Around the time we started our agency, we began our digital marketing education with the Internet Marketing for Smart People email series and My.Copyblogger free ebooks. Those compelled us to become paid Authority members, which further encouraged us to attend Authority Rainmaker in its inaugural year and then again the following year. Since then, we’ve purchased the Rainmaker Platform for two client projects; one is a professional home organizer, for whom we’ve built a complete online education program and sales funnel, and the other is a private online education program for a power tools company. About nine-tenths of our content marketing education has come from Copyblogger. And since we run a content marketing agency and our lives depend on it, it’s a good thing we stumbled on this website. Copyblogger and its people have trained us to produce consistent, quality content, taught us to build authority, and given us confidence. Through Copyblogger, we’ve learned what it will take to make our idea real and how to build our business. So whenever someone comes to us with an idea, or asks for online marketing advice, we tell them to go to Copyblogger. It has been a long road already, and we haven’t sold a single product yet. But we’re going to. On December 11, 2015 at the annual Long Manes & Candy Canes event, The Longhairs will launch Hair Ties For Guys, and our first line of products for men with long hair. And we’ll see if this whole hair tie thing pans out after all. Until then, Round Two will be pumping out dope websites and caring about our clients’ businesses like they were our own. Because we finish projects like diving touchdown receptions. So if you have long hair — guys and gals — throw down a few hair whips. And if you have an idea, make it real. Thanks to Chris and Lindsay for appearing in our Hero’s Journey series.